The first show in this resort city in the Riverside County area. Rick Allen celebrated his 51st birthday at this show with the crowd singing to him. 'Promises' replaced 'Make Love Like A Man' in the set. 'Let's Get Rocked' was also played earlier than normal. Joe accepted many drinks from fans in the front row during the show. 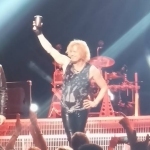 Sav toasted the crowd at the end with one of his drinks (see Fan Photos). Joe added in the David Bowie 'Heroes' tag during the end of 'Hysteria'.